The woman recently poisoned has died. Nice headline, Rods. You read the daily fail, don't you? From a legal point of view how can this possibly be classed as murder before any real evidence is gathered to suggest that someone or group deliberately targeted this civilian woman who has no obvious connection with intelligence services of either Russia, UK, USA, or any other country. Everything is pointing to an "accidental" poisoning from a receptacle or item that has connection to the original attempted murder of the ex-Russian agent and his partner in Salisbury. This is "manslaughter" if it can ever be proved, and the CPS excepting to take on such a case! Typical media jumping to conclusions. Counter-terrorism detectives leading the enquiry announced on Sunday night they had launched a murder probe. ................and it still amazes me, given to what is suspected to have happened that they can suggest murder, not manslaughter; but still that will be the eventual charge IF they find anyone who can be held responsible.........and the CPS support charges and a court case! ...........excuse me President Putin, can you now hand over the agents of yours who attempted the first murder as we think they discarded a contaminated container or item that has caused manslaughter....................yeah, sure!! Thanks Entwood, I understand that bit in normal cases, but this one is very different and will continue to have MI5/6 all over it knowing (repeated again tonight) that the couple must have come into accidental contact with Novchok. All officers and intelligence agents, with free access to all areas, will know that this was an accidental contamination and will never be a murder charge. I suppose that, when someone is killed with a military nerve agent, it starts off as murder by default, until it can be shown that it was indeed the "left overs" from the Skripal poisoning. After all, it could have been deliberate. We don't know until it is proven beyond doubt that it wasn't. Maybe the Russians picked another victim at random to cause confusion? Maybe Porton Down leaked something? Who knows at this stage? Dangerous place this England. I have managed to avoid picking up any containers (makes supermarket ready meals tricky). Think you,ll find that they were father and daughter. Good point. Maybe they were practising for Trump? Grassy knolls are so 1963. Perhaps in Kent, being both isn't uncommon? Yes, it was. I had a slip of the old brain box!! That distillery in dear old Bis'ol, has scored an own goal with a sick joke. Not funny!! I will keep an open mind on the cause and motive for these unexplained deaths. Let the police gather their evidence along with their experts and see where it leads to. I deliberately haven't commented with any speculation as we know nothing at this point apart from press conjecture on what might have been the victims last movements and their lifestyles. When the police say they have started a murder probe, I take that as being an accurate and credible statement and report according, even in these days of sound bites and fake news. The bloke is reportedly recovering and police have been able to speak "briefly" to him.Whether any information he has so far been able to give[if anything useful]may be useful or-as is to be hoped-when he fully recovers he may be able to shed better light on things to point the authorities in the right direction. Might be another one affected...……..
Police have now released this statement where a small bottle containing novichok has been recovered from the male victims house. This might just provide the clues to reveal the truth about this story. Maybe The Don will ask Putin when he meets him. Probably just a misunderstanding. The facebook conspiracy theorists are having fun with similar meercat memes today! Where GCHQ chief has announced that the UK is going on the cyber offensive, then that might drag UK data centres into a hot cyber war. Novichok perfume on a data centre aircon input filter would be an easy silent & deadly UK target. Although, I don't know anybody that works in a UK data centre, if you do, tell them to buy a nerve gas sensor and to mind how they go. In case it has been lost by anybody on here the perfume bottle contained enough Novichok to kill 4000 people, now imagine if a couple of kids had got hold of it and run through a busy shopping area spraying each other and those around them as a game. 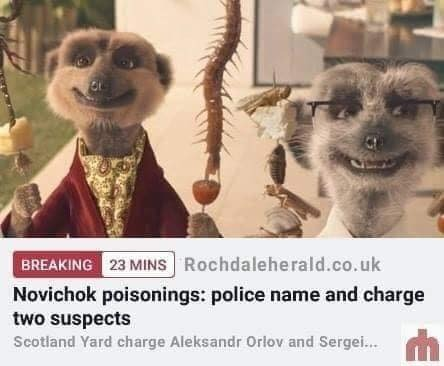 This is how dangerous and reckless Russia has been in a hot war attack on the UK and the UK security forces think there is another discarded perfume bottle out there. The UK has forward announced IMO stupidly (so they can get their funny money out ) powers to take the money against the Russian oligarchs. International Western action needs to be taken, otherwise money laundering just moves funny money from one tough country to an easy another. The real measure will be if it hurts the mobs global boss of bosses Ukrainian Semion Mogilevich who resides in Russia and controls all major global mob gangs including since the late 1990s/2000s in the US (FBI decimated the Italian gangs and they were an easy target for a much tougher & ruthless opponent) with Trumps help from his Mar a Lago base. More importantly, a senior Russian official said that, if the UK were to launch a cyber attack, it would be considered an act of aggression. Someone should have told the bleedin idiot that cyber attacks are best done in secret, preferably untraceable too. Doh! Agreed but that wouldn't be very British ! Publically available data investigative UK company Bellingcat report on what they have found out so far on the Russian 'tourists' GRU officers is interesting and also shows how sloppy their tradecraft is at times. It is going to be interesting on what else they manage to find out as their MH17 report shows, it was considerable. Perhaps, in future, for the purpose of deflecting accusations of conspiracy theories, you could quote your sources. Whether those sources are considered to be reliable,or not, would down to the opinion of the reader. Personally, I think that particular article is on the money. Not a problem when it comes to sources as I do the same and won't repeat things that are just gossip. Occasionally, I will cite things like the Christopher Steele dossier, but much of that has now been substantiated as they are considered reliable sources. The same applies to most ex-spooks as they are by nature cautious with what they report as they put their professional reputations on the line and are consistently right. The same applies to academic sources. I like referencing and using charts with a good example being a recent report on Cat 3 and above hurricanes that reach landfall on the US East coast from 1900-2017 from the Americam Meteorological Society, which shows there were many more in the early 20th century compared to now.